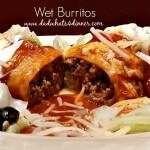 Saucy Wet Burritos made with ground turkey, easy to make, freeze well and your kids will love them. Check out the secret ingredient! I’m not sure what it is but I’ve had little desire to cook this week. Maybe it’s because my girls are at camp and I have been at baseball every night with my son. Last night I was home but my son was out and my wife spent the evening getting her hair done. Still nothing. Father’s Day was spent on the road dropping the kids off at camp so we just picked up some ribs from the local market. I threw them on the grill with a salad. That is the most cooking I’ve done all week. If you are lucky enough to send your kids to a good summer camp, it is well worth it. Our kids have attended Springhill christian camps for years. They have a location in Seymour, IN and Evart, MI. It is your typical summer camp with horseback riding, lake activities, and zip lines. My summer camps never had zip lines! They have a blast, in a very loving environment. They get back in a couple of days so maybe I will get my enthusiasm back for cooking. We miss them very much, but happy they can have this time away to grow and learn. A few weeks back I made one of my kids favorites. 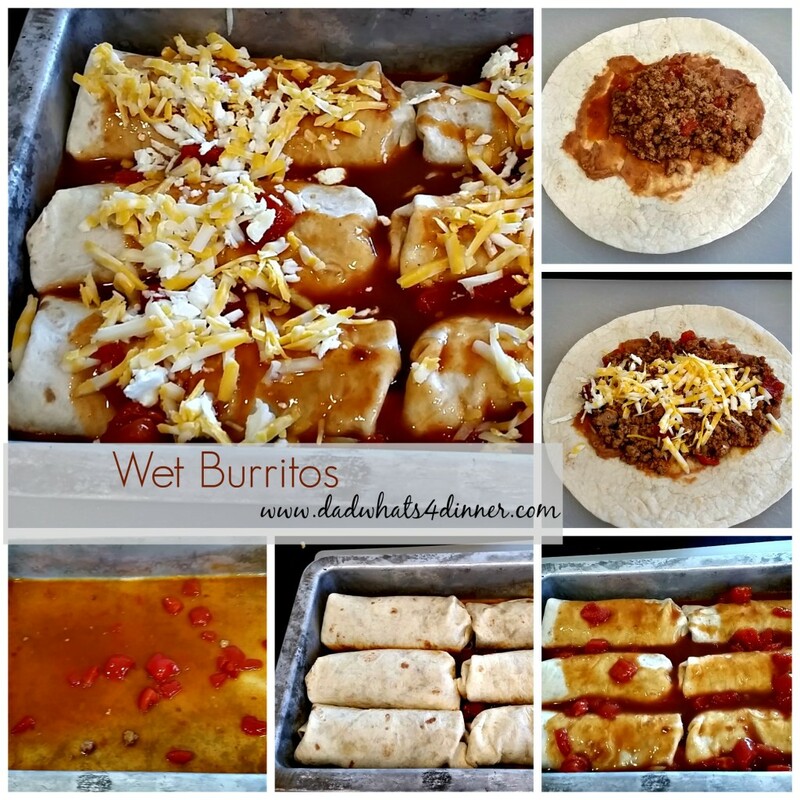 Wet Burritos. 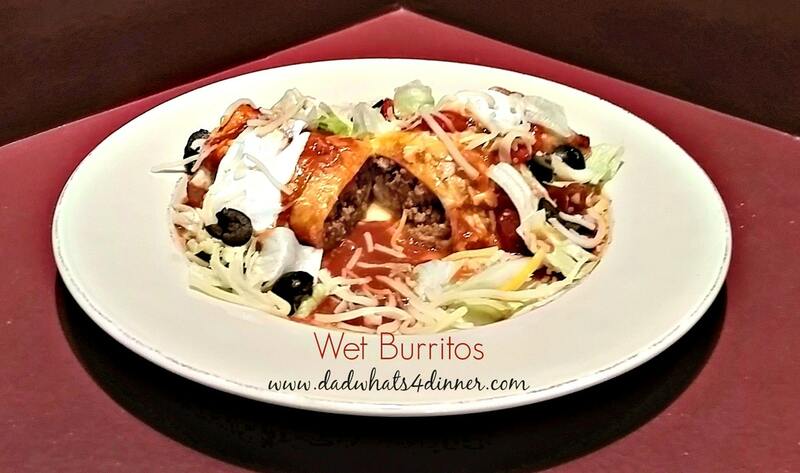 If you have never had wet burritos you and your family are in for a treat. I cooked this for the blog and made a double batch to freeze the second batch. They freeze great.. Since I am not cooking this week, I grabbed the second batch from the freezer for dinner. Always great to have extra meals frozen and ready to go.. If you asking yourself “what the heck is a wet burritos” well it is simply a meat (I have made these with chicken, ground beef, ground turkey, shredded beef or pork) and bean burrito with a spicy gravy and cheese on top. It’s a mix between a enchilada and a burrito. Give them a try, you will never go back to a regular burritos. Don’t be scared of the long list of ingredients because they are simple to make.. This recipe makes a double batch and is made with ground turkey. To make: Brown ground turkey, onion, and garlic. Drain off any fat. Add green chiles, Worcestershire sauce, paprika, oregano, chili powder, cumin, pepper, and remaining can of tomatoes with sauce. Simmer for about 5 minutes. As meat simmers, heat beans in microwave with some cumin and cheese. Stir and set aside. In a large saucepan make the gravy by combining Herdez Ranchera sauce, enchilada sauce, beef gravy and remaining can of diced tomatoes. Heat until almost boiling. Preheat oven to 375 degrees F. Soften tortillas according to package directions. To assemble your Wet Burritos: Add a cup of gravy mix to bottom of two 13×9 baking dish. Layer each tortilla with some of the meat mixture, bean mixture, and cheese. Fold sides of burrito in, then roll from the other sides until you have a”package”. Place the burrito seam side down in the baking dish. Continue with remaining tortillas. When completed, pour sauce equally over each dish and top with remaining cheese. Bake 15-20 minutes until cheese is melted and burritos are heated through. Serve burritos with extra sauce and your favorite toppings. 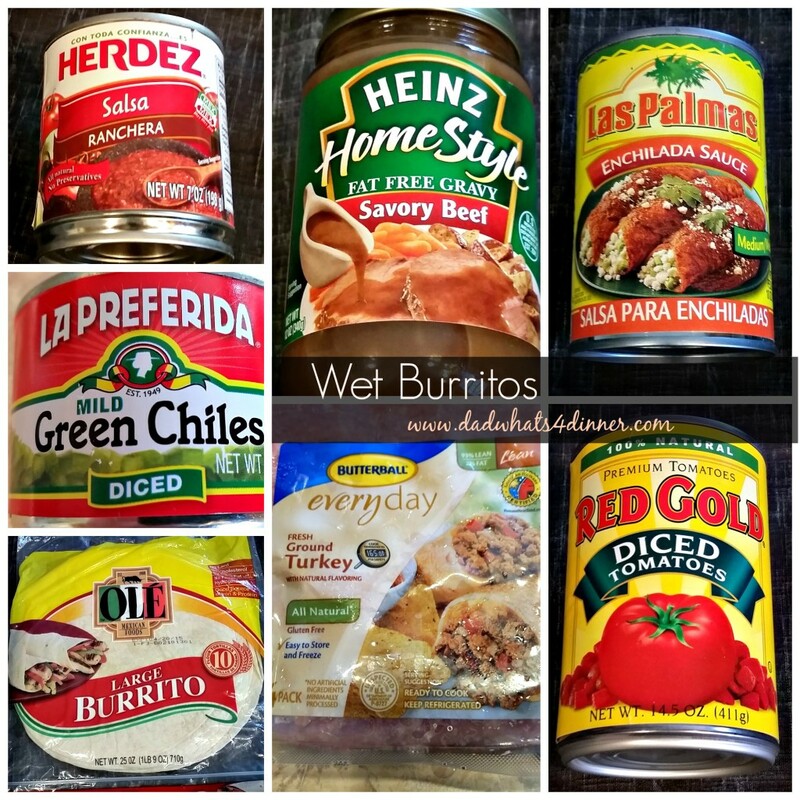 Saucy Wet Burritos made with ground turkey, easy to make, freeze well and your kids will love them. Check out the secret ingredient. Brown ground turkey or beef, onion, and garlic, With the back of wooden spoon. break up meat into very small pieces as it cooks. Drain off any fat from browning. Add green chiles, Worcestershire sauce, paprika, oregano, chili powder, cumin, pepper, and remaining can of tomatoes with sauce. Simmer for 5 minutes. As meat simmers, heat beans in microwave with 1/4 tsp. cumin and 1/2 cup of cheese. Stir to combine. In a large saucepan make the gravy by combining Herdez Ranchera sauce, enchilada sauce, beef gravy and remaining can of diced tomatoes. Soften tortillas according to package directions. Add one cup of gravy sauce to the bottom of two 13x9 baking dish. For each tortilla, layer 1/12 of the meat mixture, 1/4 cup of the bean mixture, and 1/4 cup of cheese. Fold sides of burrito in, then roll from the other sides until you have a"package". Place the burrito seam side down in the baking dish. Continue with remaining tortillas. When completed, pour sauce equally over each dish and top with remaining cheese. Bake 15-20 minutes until cheese is melted and burritos are heated through. Freeze second baking dish if desired. These sure look delicious to me! We all need a cooking break once in a while. Enjoy the kids and their summer activities! Wonderful recipe and easy too. I like the idea of having a pan full in the freezer. Always try to double recipes that freeze well. Thanks for stopping by. Thanks Jhuls. Have a great weekend. Happy FF! I love this and I especially love that they can be frozen for later! I have always loved Tex-Mex and this would be just right up my alley! 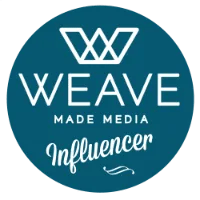 I found this over at Inspire Me Monday, but would be so honored if you would stop by and share this at my new link party at Celebrate and Decorate! Hi Clioe. Thanks for stopping by. I tried to follow your link to your new link party Celebrate and Decorate but I was getting security alerts from my security system for malware. Sorry. I can comment on more than just how good they look..I just finished making them and they taste are every bit as good as they look in the pictures, simply put they are delicious. Easy to make..quick to the table. As far as the cheese goes I would have to say that a Monterey Jack /Cheddar combination works well, the Monterey Jack melts very nicely and helps hold the meat mixture together. The gravy mix is what pulls these together..it’s delicious.. Thanks Jack. Your right the gravy is what makes this dish. You can make it as mild or hot as you like. Thanks for making and leaving comments. 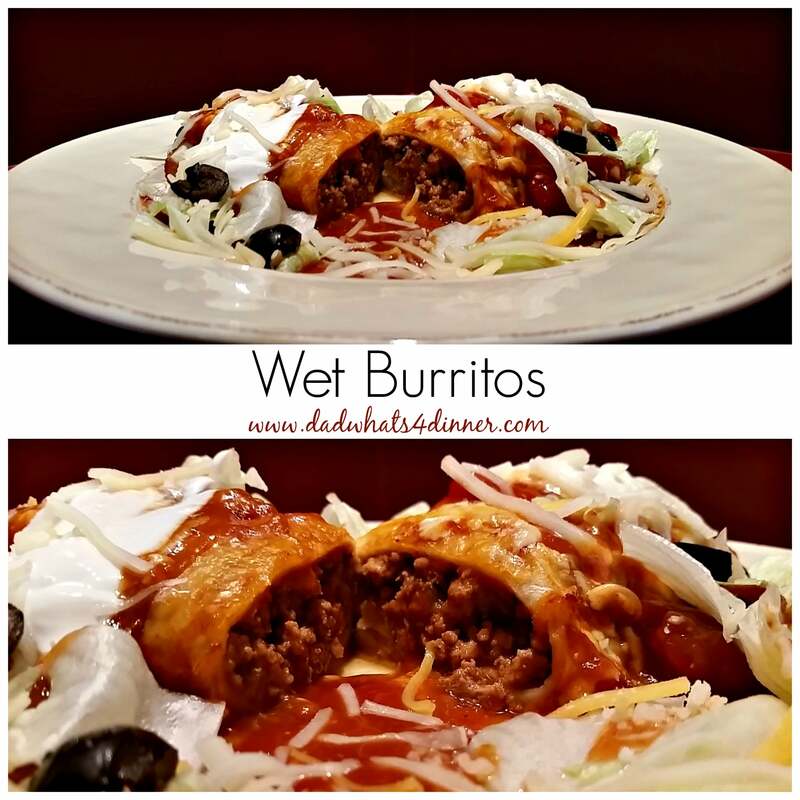 Love me some wet burritos. Or, as Taco Bell likes to call them “enchiritos”. I just call them, “hot, cheesy, saucy deliciousness.” Thanks! You bet. 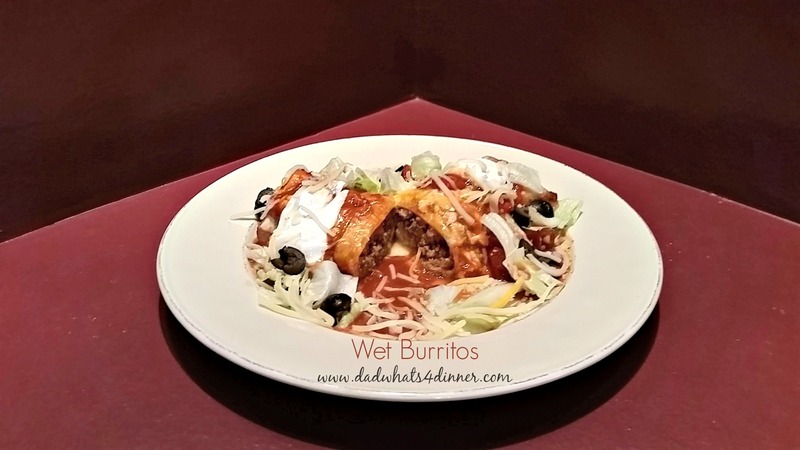 Nothing better than simple and easy wet burritos. Thanks for stopping by.